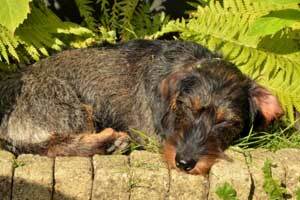 With temperatures soaring it is important to know about the effects of heat on your pets. With their thick coats they can find it very hard to regulate their temperature and this can lead to heat stroke. A dog was brought in to us recently suffering heat stroke after going on a little walk on a warm but overcast day. The dog was overweight and had a dark coloured coat (which absorbs more heat) and these contributed to the dog developing heat stroke. It can occur if an animal is exercised during warm temperatures, locked in a car or conservatory and is more likely in brachycephalic breeds such as pugs or bulldogs. Dogs can only sweat through their paws and lose most of their body heat by panting. If you have a dog with heat stroke, often the first signs are panting and lethargy or collapse. It is important NOT to place the dog into cold water or put wet towels over them. The cold water can send them into shock and the towels can warm up and act as a barrier, making the animal even hotter. It is also difficult to prevent the temperature from dropping too low once the animal is wet. Veterinary treatment should be sought immediately but there are first aid measures that can help…. · Using a fan or air conditioning. Dogs with heat stroke can develop swelling of the brain if untreated, which may lead to seizures and death. If brought to a vets promptly, they will be placed on a drip, have ice packs placed in the armpits and groin, given medication to prevent intestinal damage, which commonly occurs with heat stroke and sometimes, oxygen therapy, particularly with bulldog type breeds. Dogs recover quickly if there has been no permanent damage and often go home the next day. They commonly have diarrhoea, so will be given medication for this. Prevention is better than cure so avoid exercising dogs in the heat of the day, take particular care with brachycephalic breeds and those with heart conditions. Make sure there is always access to water. NEVER shut your dog in the car, as even with the window open, the temperature can quickly rise. Keeping some long haired breeds closely groomed may be appropriate in warm weather. Products such as Kool coats can also help to keep your dogs temperature more comfortable.